Produced in the city-states of Ur, Erech, and Babylon. Late third and early second millenia bce. 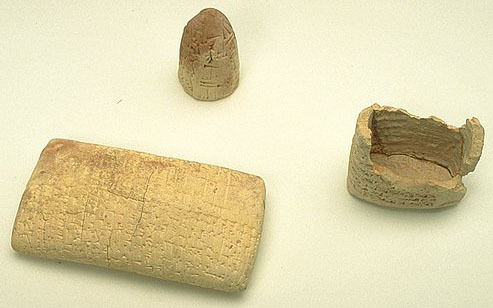 All of the clay tablets shown here are inscribed with cuneiform text, the words pressed with a narrow beveled instrument into the soft surface of the clay, which was then dried thoroughly. The smallest tablet records the receipt for the delivery of thirteen copper sickles. In its center a seal has been pressed, not unlike an official stamp or embossing seal in modern documents. The largest tablet is a receipt for sheep and goats set aside for the temple of the gods. The date is given as the month of Shesh-da-ku, in the year "in which the lands of Kimash and Humurti were devastated"--2250 BCE, during the reign of Shulgi, the first king of the dynasty of Ur. The cone-shaped tablet is the record of the building of a temple to the goddess Eanna by Sin-gashid, king of Erech in 2000 BCE. The broken tablet is a contract of marriage and adoption by which Nanna-aya takes as his wife Lamassum and adopts her four children. This document is dated to the eleventh year of Samsuiluna, first king of the dynasty of Babylon (1744 BCE). Sun-baked tablets were often wrapped or encased in an additional layer of clay. This casing was also inscribed with text and seals on the interior as well as the exterior of the package. It had to be cracked open to reveal the inner "letter." Shown here is a fragment of an original envelope.